Every year, millions of people look forward to getting their tax refunds. But if you're one of those unfortunate folks who has to write the IRS a check every year, you might get even worse news: an extra bill for interest and penalties. Most workers have their employers withhold taxes from their paychecks. If you correctly fill out the W-4 Form that your employer gives you, then the amount taken out of your paycheck should be enough to avoid any interest and penalties. Typically, as long as you owe less than $1,000 in tax after you account for withholding and tax credits, you're in the clear. Also, if you paid at least 90% of the tax you owed in the current year, you usually won't get hit with a penalty. 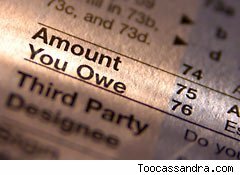 But if you owe more -- especially if you earn income as an independent contractor or own a business -- then you'll need to make quarterly estimated tax payments to avoid getting hit with penalties. Calculating estimated taxes is nerve-wracking even for tax-savvy people. Figuring out how much you owe this year is hard enough. Trying to guess how much you'll owe on your return for next year seems close to impossible. That's why the IRS has a simple rule to make it as easy as possible to avoid penalties. For most taxpayers, if you take your total tax from your last year's return and divide it by four, making four equal quarterly payments of that amount this year is guaranteed to keep you from owing penalties. For those who earn $150,000 or more in adjusted gross income, you'll have to pay slightly more -- a total of 110% of your last year's tax. That rule works even if you have nothing withheld from any paycheck. Those who do have tax withheld can reduce their payments accordingly. Even if you slip up, penalties aren't the end of the world. Because interest rates are so low right now, the penalty amount for your 2011 taxes is only about 3% to 4% annually. But since it's easy to avoid penalties, there's no reason to pay even that much. So don't give the IRS more than it deserves -- keep your hard-earned money for yourself!